The authors report the results of the first comparative United States–United Kingdom public engagement experiment, finding that participants focus on benefits rather than risks and, in general, had a high regard for science and technology. 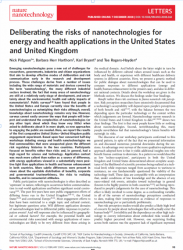 Application context was much more salient than nation as a source of difference, with energy applications viewed in a substantially more positive light than applications in health and human enhancement in both countries. More subtle differences were present in views about the equitable distribution of benefits, corporate and governmental trustworthiness, the risks to realizing benefits, and in consumerist attitudes. Nick Pidgeon, Barbara Herr Harthorn, Karl Bryant and Tee Rogers-Hayden (2009) in Nature Nanotechnology (Vol. 4, Feb 2009): Deliberating the risks of nanotechnologies for energy and health applications in the United States and United Kingdom (external link, last accessed 18 Dec 2013).